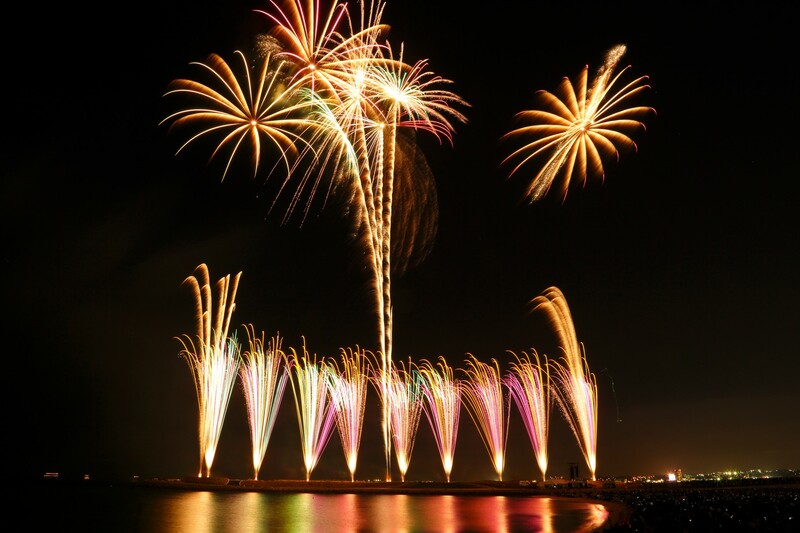 Billed as the earliest fireworks festival of the year in Japan, the Ryukyu Kaiensai blasts its 16th annual edition to the skies above the Ginowan Tropical Beach on Saturday, Apr. 13. 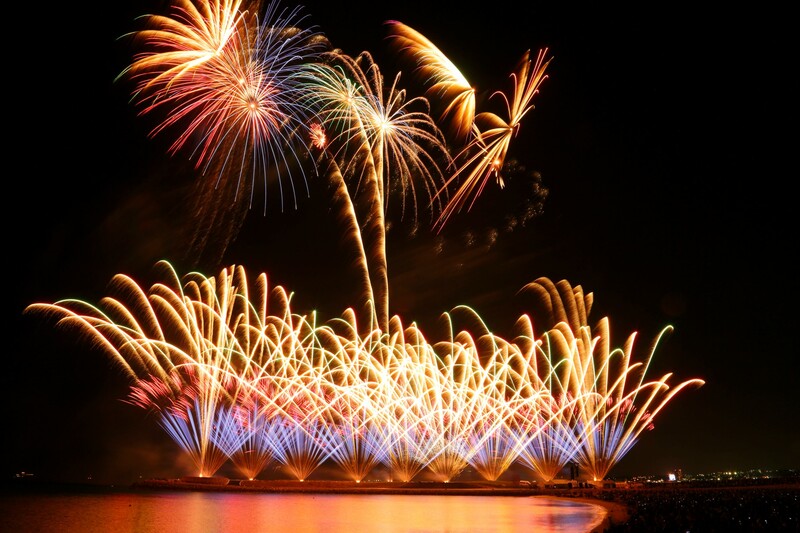 As every year, the show features an impressive collaboration of 10,000 fireworks and music. As every year, the show features an impressive collaboration of 10,000 fireworks and music. The grand Ryukyu Kaiensai show highlights Okinawa’s unique nature and culture through the artistry of the traditional Japanese fireworks. It also boasts its theme of the “Earliest impression of the summer in Japan”. 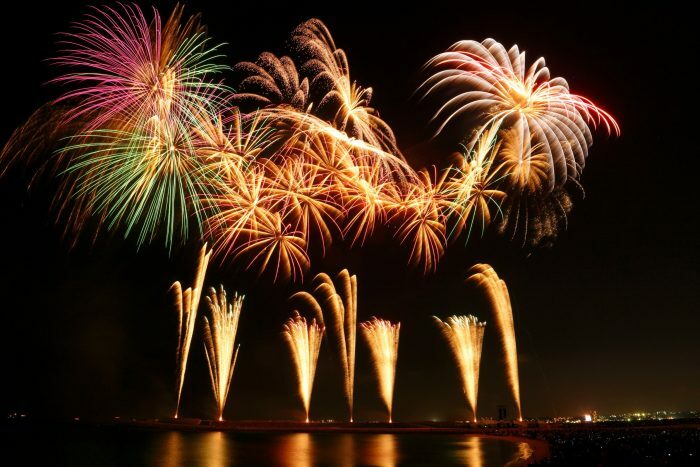 It’s one of the biggest entertainment events of the year in Okinawa and showcases the fusion of original fireworks, Japan’s traditional summer entertainment, and the music and culture of Okinawa. It’s one of the largest fireworks illusion events in Japan. The Ryukyu Kaiensai was originally designed to emphasize to potential visitors to Okinawa that the island is not only a marine leisure resort but has many other attractive points that appeal to a wide range of visitors. It also aims to raise Okinawa’s social status in the eyes of the rest of the country. The Ryukyu Kaiensai has always been scheduled to conform to Okinawa’s beach opening season in April every year. It’s a festival that people from Okinawa, mainland Japan and overseas enjoy. 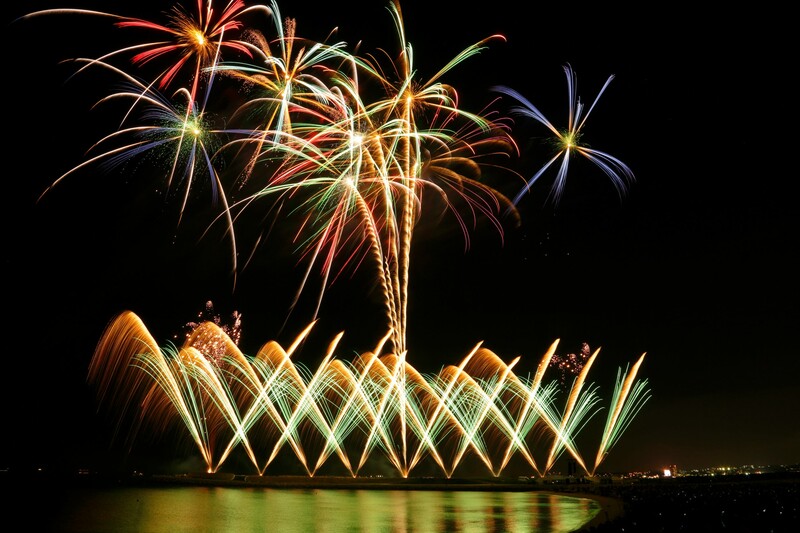 The fireworks show at the Ryukyu Kaiensai is designed by world-renowned designer Junko Koshino. In 2017 Koshino was honored as a person who made a significant contribution to the culture of Japan. 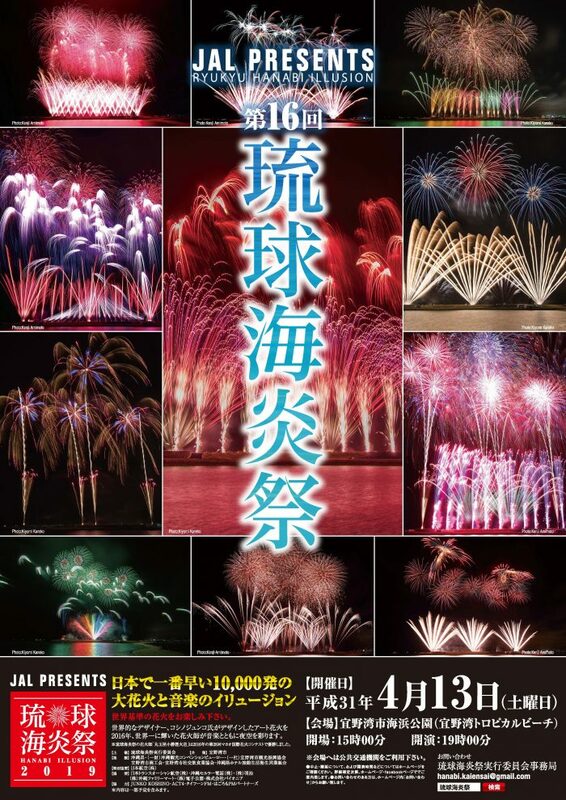 The Ryukyu Kaiensai started Koshino-designed fireworks in 2010, and its contents have improved every year since. Thus, 2019 marks the 10th designer event and everyone is invited to see how far the show has evolved. For the show, Koshino draws a rough sketch for the fireworks, then this year pyrotechnicians from Marutamaya Kokatsu Enkaten the company that won the first place at the Macau International Fireworks Display Contest in 2016, created the pyrotechnics based on Koshino’s ideas. The fireworks and music at the show are synchronized through a computer to match perfectly. The computer controls all timing and agenda of direction extremely precisely in 1/30-second steps. The fireworks and music at the show are synchronized through a computer to match perfectly. The music to send the specially designed fireworks up to the sky is “Barcelona,” a collaboration of Spanish opera singer Montserrat Caballé and Freddie Mercury, the lead singer of Queen. The designer fireworks show lasts about an hour and features pyrotechnics seen never before. More details of the show in English is available athttps://www.ryukyu-kaiensai.com/. Ticket information is at https://www.ryukyu-kaiensai.com/ticket/. 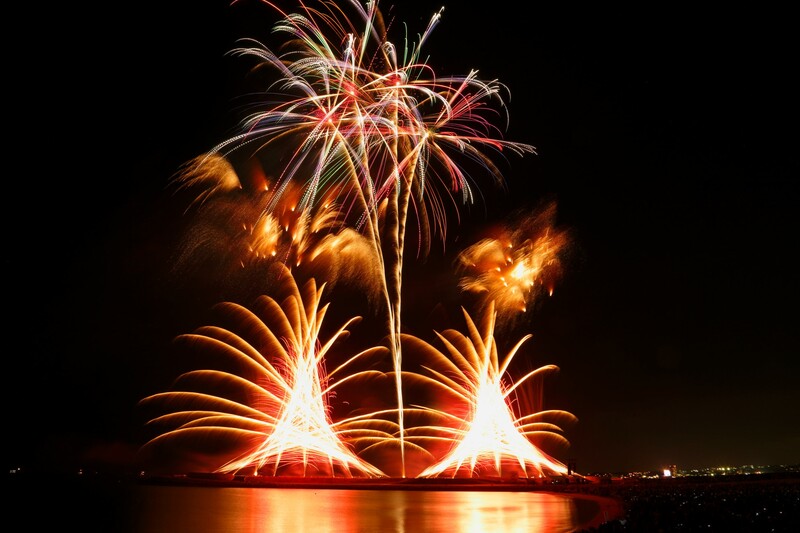 As a prelude to the fireworks, an event titled Ryukyu EngeiKai takes place as a collaboration event. The Ryukyu Engeikai takes place at the Convention Center Theater where visitors can enjoy Japanese traditional performances of Rakugo, Roukyoku and Koudan (Japanese Storytelling) in one place. Yuujaku Sanyuutei, one of the leading performers of Rakugo in the nation, makes the audience laugh telling Japanese humorous tales. Roukyoku performer is Daifuku Tamagawa holds his one-man show more than 50 times a year. Koudan performer Matsunojou Kanda is known as the performer to whose shows recently are “The hardest to get the tickets in Japan”. 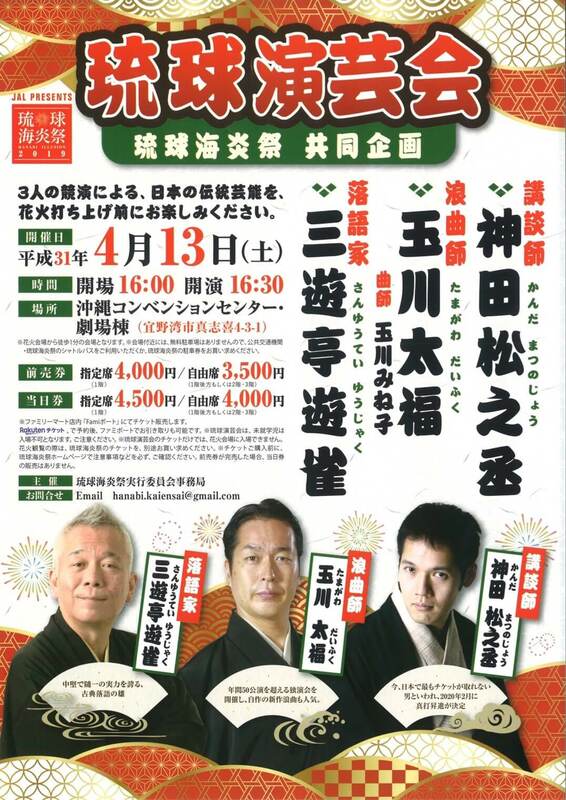 The Information web page of the Ryukyu Engeikai is at https://www.ryukyu-kaiensai.com/event/. Time: Gate opens 3 p.m.; Fireworks 7 p.m.
Time: April 13 (Sat), doors open 4 p.m.; show starts 4:30 p.m.; finish 6:30 p.m. Reserved seats ¥4,500 (1st floor front), ¥4,000 (1st floor rear, 2nd floor or 3rd floor) at door. Children under elementary school age no entry. To enter Ryukyu Kaiensai, visitors need to purchase separate Ryukyu Kaiensai ticket.